By 2154 Earth’s resources have been depleted and a corporation is mining a mineral called unobtainium on the utopian planet of Pandora. Paraplegic former Marine, Jake Scully (played by Sam Worthington) takes his twin brother’s place on a mission, out-posted to Pandora. This is inhabited by the 10 foot, blue native Na’vi, who live in amongst the lush and dense flora and fauna of the forestland. Jake’s mission is to gather intel for the military (led by Colonel Quaritch, played by Stephen Lang) by infiltrating the indigenous natives through the use of an ‘avatar’. In return for this, Quaritch confirms that the corporation will pay to restore Jake’s legs. An avatar is a Na’vi / human hybrid, who are operated by genetically matched humans; Cameron’s idea is that future technology allows human intelligence to be placed within a remote body. Avatars are used, for narrative purposes, because the air on the planet is poisonous to humans. Dr. Grace Augustine (played by Signourney Weaver, who mentors Jake as Head of the Avatar Program), Norm (a scientist, played by Joel David Moore) and Jake are posted in the midst of the richest onobtanium in the area. 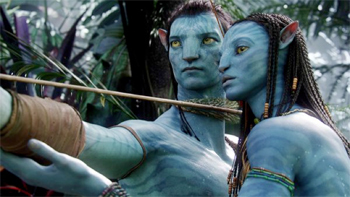 Jake’s avatar is attacked whilst in the forest, and he is rescued by a female Na’vi, Neytiri (played by Zoe Saldana). He gets initiated into the warrior tribe, and falls in love with her. Meanwhile the Colonel plans to exterminate the Na’vis. This is the catalyst for the soldier’s moral dilemma and the quest of the film - whose side is he on for the battle of Pandora’s fate?